Recommended send times work both when you're sending individual messages or scheduling a sequence to dozens or even hundreds of recipients. You can find details on how this feature works below. How do I schedule an individual message at a recommended time? Once your message is composed and ready to be scheduled, click the Send Later button. You'll see the bar graph directly below the calendar picker and hovering over each bar will give you an indication of the time (in your time zone). 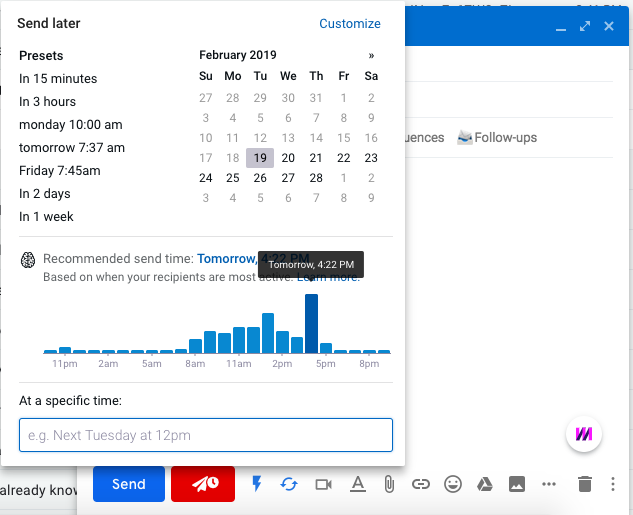 If you click on one of the bars (we'd suggest the tallest bar) we'll populate the recommended time in the text field for you to confirm.Once you hit 'Schedule Email' your message will be scheduled to send. The graph will always show you the best time in the next 24 hour window. How do I schedule a sequence with recommended send times? When you're creating a sequence, you can choose to send messages at the recommended time for each individual recipient if you're on our Growth plan or above. You'll see this option in the scheduler for Stage 1. 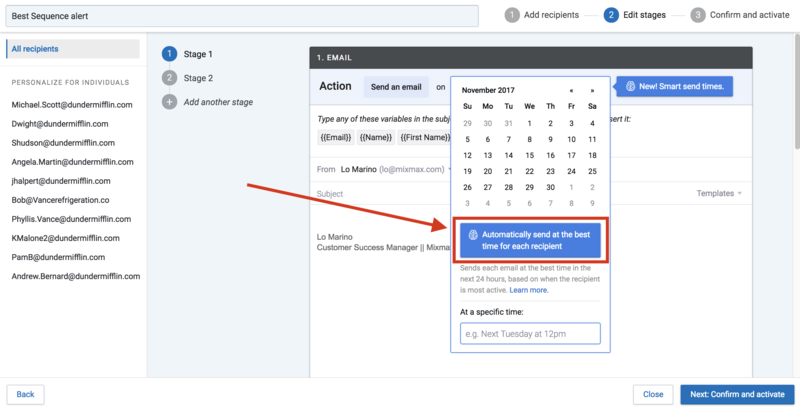 When you choose recommended send times for sequences, Mixmax will automatically send at the next available recommended time for each recipient and for every stage. If there isn't enough data to determine for a specific recipient, the sequence will default to sending the message as soon as you activate the sequence. Please keep in mind if you use recommended send times on your sequence, it will apply to all future batches of recipients. How do we determine the recommended time? Mixmax uses data based upon your recipients' activity. Activity refers to opens, clicks, downloads, replies, and meeting confirmations - the same information we're tracking in your Live Feed. The recommended send time is calculated based upon when that recipient is most active. 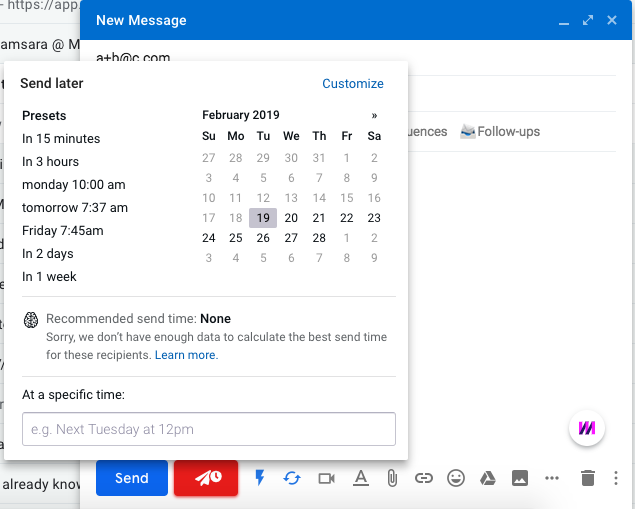 If your message is scheduled to multiple recipients or a contact group, we'll show the best time based upon the activity of all recipients listed. You'll notice the graph change when you add or remove recipients on the draft. What does it show if I have never contacted this recipient before? Even if you have not contacted the recipient before, we may still be able to show you a recommended time if they have activity from other Mixmax messages. If there is not enough data for the particular recipient, we will fallback to checking for activity records across the domain. Recommended send times for individual messages are available on any of our paid plans.